This will put you in a Cinco de Mayo baking mood: traditional Puerquitos, a soft, light, and slightly cinnamon spiced sugar cookie! The Mexican cookie making video needs no translation: it’s in the universal language of baking love. http://www.youtube.com/watch?v=oh-Wro-uK-E . “Necessity is the mother of invention”: I needed a pig shaped cookie cutter and didn’t want to take the time to cross the bridge to La Roux, our local well stocked (Williams Sonoma). The baker in the video made a cut-out for her Piggy Cookies; I followed suit since “imitation is the highest form of flattery!” Using a small paring knife worked better than a toothpick to trace around the edges. A cookie cutter dipped in powdered sugar would have been easier. Still the results were effective! 1. In a medium sauce pan combine the water and brown sugar and boil for 5 minutes or so, until the sugar has melted and the mixture has made a syrup. Stir in the honey. 2. Add the butter, stir until it’s melted. 3. In a medium mixing bowl combine the dry ingredients. Whisk to blend. 4. Add the dry ingredients to the butter/sugar mixture. Stir to blend evenly. Add the egg, stir again to blend evenly. 5. Line a bowl large enough to hold the batter with 2 sheets of plastic wrap. Pour the batter into the bowl. Draw the corners and edges of the plastic wrap together, forcing the air out and twist to form a seal. Refrigerate the dough for 2 hours – two days. 7. Cut the dough in half, putting one half back into the ‘frige. Roll the other out on a GF floured surface to 1/4 inch thickness. If the dough is too sticky, knead in a little extra flour. Using a pig shaped cookie cutter, cut out shapes and place on the prepared baking sheet. Bake for 10 minutes or until the cookies have puffed and are medium brown. Note: the edges of the cookies will be more discreet if you chill the cut out cookie dough for 5-10 minutes before baking. 8. Transfer the cookies to a rack to cool completely before sifting with confectioners’ sugar. It’s OK to sift on the sugar whilst the cookies are still a little warm on the cookie sheet…. Cinco de Mayo cookies ready to serve! Tags: gluten free Cinco de Mayo cookies, gluten free mexican piggy cookies, Gluten Free Mexican Spice Cookies. Bookmark the permalink. Previous post ← Pizza on the Grill – it’s a cinch! 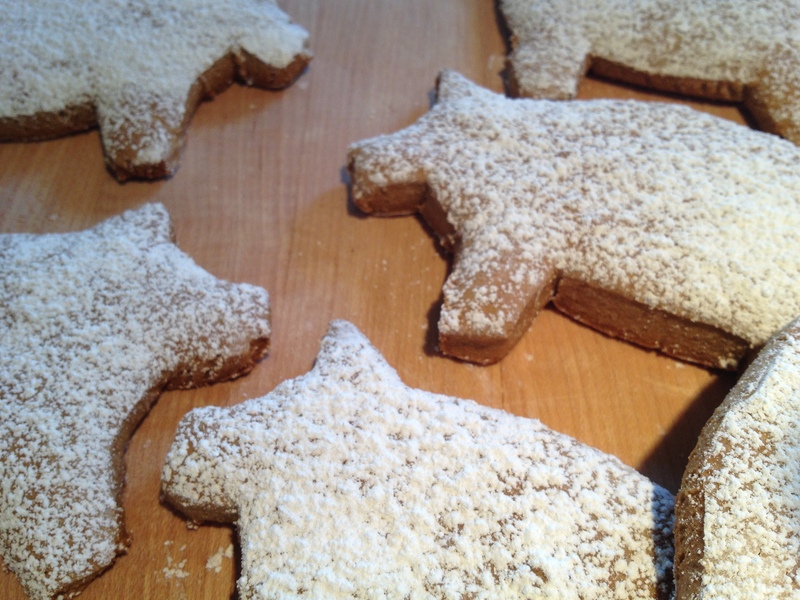 These look like a great spiced cookie and the pig shapes look very professional.